When I began writing Penny and Twisted’s story, back when what would eventually become Chapter Seven of This is the Route of Twisted Pain was all that existed of this world, there really wasn’t a stated club to deal with. But when Twisted wouldn’t stop talking that little story became part of a larger book, and I learned so much about him, Po’Boy, our Incoherent MC … and their enemies. I also learned of their allies, those friends and supporters who—even if they wore different patches—were proud to call each other brother. 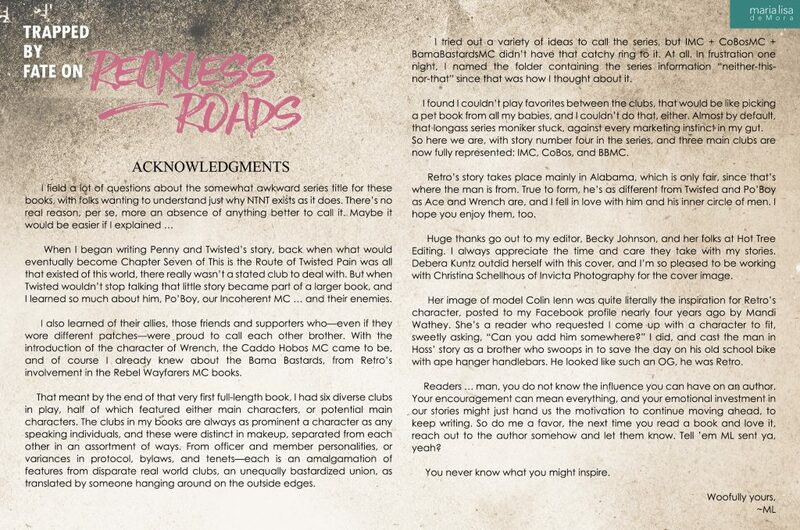 With the introduction of the character of Wrench, the Caddo Hobos MC came to be, and of course I already knew about the Bama Bastards, from Retro’s involvement in the Rebel Wayfarers MC books. That meant by the end of that very first full-length book, I had six diverse clubs in play, half of which featured either main characters, or potential main characters. The clubs in my books are always as prominent a character as any speaking individuals, and these were distinct in makeup, separated from each other in an assortment of ways. From officer and member personalities, or variances in protocol, bylaws, and tenets—each is an amalgamation of features from disparate real world clubs, an unequally bastardized union, as translated by someone hanging around on the outside edges. I tried out a variety of ideas to call the series, but IMC + CoBosMC + BamaBastardsMC didn’t have that catchy ring to it. At all. In frustration one night, I named the folder containing the series information “neither-this-nor-that” since that was how I thought about it. I found I couldn’t play favorites between the clubs, that would be like picking a pet book from all my babies, and I couldn’t do that, either. Almost by default, that longass series moniker stuck, against every marketing instinct in my gut. So here we are, with story number four in the series, and three main clubs are now fully represented: IMC, CoBos, and BBMC. Retro’s story takes place mainly in Alabama, which is only fair, since that’s where the man is from. True to form, he’s as different from Twisted and Po’Boy as Ace and Wrench are, and I fell in love with him and his inner circle of men. I hope you enjoy them, too. Huge thanks go out to my editor, Becky Johnson, and her folks at Hot Tree Editing. I always appreciate the time and care they take with my stories. 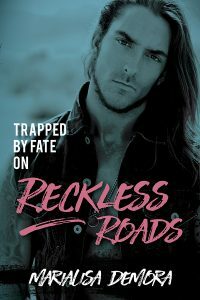 Debera Kuntz outdid herself with this cover, and I’m so pleased to be working with Christina Schellhous of Invicta Photography for the cover image. Her image of model Colin Ienn was quite literally the inspiration for Retro’s character, posted to my Facebook profile nearly four years ago by Mandi Wathey. She’s a reader who requested I come up with a character to fit, sweetly asking, “Can you add him somewhere?” I did, and cast the man in Hoss’ story as a brother who swoops in to save the day on his old school bike with ape hanger handlebars. He looked like such an OG, he *was* Retro. Readers … man, you do not know the influence you can have on an author. Your encouragement can mean everything, and your emotional investment in our stories might just hand us the motivation to continue moving ahead, to keep writing. So do me a favor, the next time you read a book and love it, reach out to the author somehow and let them know. Tell ’em ML sent ya, yeah? You never know what you might inspire.